Use Newspaper Map to see if a city or town has online access to a current or historical newspaper. Provides full text for select regional, national & international newspapers. Also contains transcripts from CBS News, CNN, FOX News, and NPR. A fully searchable collection of historical African America newspapers. Contains more than 35 nineteenth- and twentieth-century Latin American newspapers featuring titles from Central and South America. To search specific newspapers, use the Search the News first, found towards the bottom of the page. 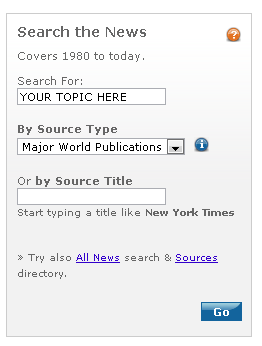 Then Search for Sources and follow the options as they appear. See example below. You can search all resources listed or just select resources, depending on what you need to do.